Investigations into the recent kidney transplant racket, which apparently emanated from the Army Hospital here, have revealed the existence of a nexus among donors, touts, hospital employees and even doctors from some government and private hospitals in the National Capital Territory of Delhi. 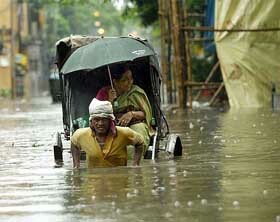 Kolkata was inundated following incessant downpour, which began yesterday, throwing life out of gear today. When Prime Minister Manmohan Singh meets his ministerial colleagues over breakfast in the coming days, the basic purpose will be to assert his authority and, more importantly, to dispel the widespread belief about his over-dependence on bureaucrats. The Supreme Court has flayed the Jammu and Kashmir High Court for making adverse remarks against Jammu Municipality Administrator Shyam Lal for taking action against the owner of Hotel Yatri in the town in an “illegal” construction case. The Supreme Court today said it had no objection to lifting of ban on night viewing of the Taj Mahal, provided requisite conditions proposed by the Archaeological Survey of India (ASI) and the Central Industrial Security Force (CISF) were met by the Uttar Pradesh Government. Mr Sergei V. Lavrow, Foreign Minister of the Russian Federation, will begin his first official visit to India from tomorrow. The Bharatiya Janata Party today hailed the Election Commission’s critical observation against the Centre saying that the Congress-led government’s move on reservation for minorities ahead of Assembly poll in Maharashtra and Arunachal Pradesh had exposed its “communal and divisive face”. Former Deputy Prime Minister Lal Krishna Advani today hit out at Congress President Sonia Gandhi for emerging as the power behind the United Progressive Alliance government. Speaking to journalists in Pune, Mr Advani alleged that there were two power centres — Prime Minister Manmohan Singh and Ms Sonia Gandhi. Information and Broadcasting Minister Jaipal Reddy today said political action or diplomatic initiative could not substitute the contribution of sensitive writers in establishing a strong and lasting bond between people of the SAARC region. Three persons were feared killed in a blast in the Mohanlalganj police station area here this morning, police sources said. The explosion took place in a house in the Kachi Pachim locality where crackers were being made, the sources said. 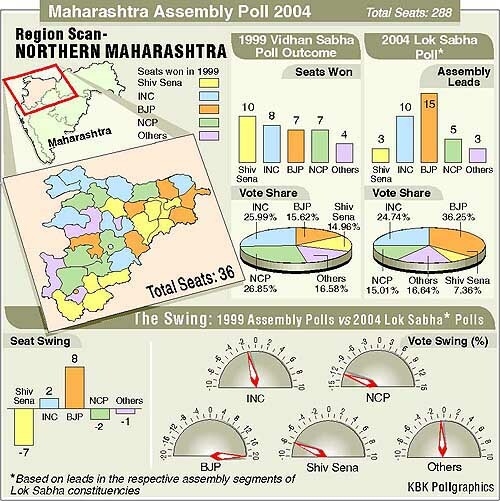 Braille ballot sheets for Maharashtra's visually impaired voters. Satya Paul to gather funds for a cause—breast cancer. MP musician makes 10-foot-long flute. Is Manisha Koirala courting controversy again? Senior Delhi Police officials monitoring the investigations claimed that this might be the tip of the iceberg. Three persons had been arrested, all donors, and their statements recorded, which indicated complicity of some employees of some hospitals. One of the persons arrested, a donor, Manoj, told the police that the doctors were aware that he was selling his kidney and was not related to the patient. The hospitals involved claimed innocence, but admitted that mistakes could have been made in identifying the donors. Doctors were unanimous that the Transplantation of Human Organs Act, 1986, needed to be amended as in its present form it was vague and liable to be exploited by parties concerned. The Act should cover the entire extended family, including in-laws, in the Indian context. At present it was only the immediate family, which was covered under the Act. The Act should also allow for monetary compensation and other facilities to the donor to eliminate illegal trading in human organs. Delhi Police officers admitted that the loopholes in the law were part of the problem and it was because of this that there was a proliferation of organised gangs because of the huge sums involved. A healthy kidney could cost any amount between Rs 70,000 and Rs 7 lakh. While there were no accurate statistics available, it was estimated that there were hundreds of poverty-stricken people in the NTC of Delhi who had sold their kidneys for money. With a clear-cut marks seen on their lower abdomen, some of these people were seen begging outside railway stations and temples in the Capital. Sources said that while the poor donor, mostly from one of the many slums in the sprawling city, got a few thousand rupees, the lion’s share was taken by the tout and the hospital employees involved. Their job was to convince the authorisation committee of the respective hospitals that the donor was a blood relative of the patient. Delhi Police officials admitted in private that they had often stumbled across the bodies of road-accident victims which bore the telltale scars of long cuts on the abdomen indicating that the kidneys might have been removed. This, they claimed, was done at the time of carrying out the mandatory post-mortem examination to ascertain the cause of death. The families of these victims of human organ thieves were normally too distressed to discover this fact and the entire act went undetected. Some of the victims said that the touts had their “ eyes and ears” in every hospital, particularly in the casualty wings and the morgues where unidentified bodies were kept. Whenever there was a demand, they searched the hospitals and alerted their contacts after striking a deal. The organ was supplied under strict medical supervision, which clearly indicated the complicity of some doctors. Meanwhile, Mrs Anita Arya, Deputy Commissioner of Police, New Delhi District, which was investigating the recent kidney racket, said that some more arrests were likely in the near future as several police parties had been sent to the neighbouring states to trace both touts as well as donors. The Union Health and Family Welfare Minister, Mr Ambumani Ramadoss, has sought the report of kidney racket from the Director-General of Health Services. When asked about facts of the report, the Minister said he had sought a report from the Director-General of Health Services on the alleged kidney racket involving doctors and staff of four prestigious hospitals in Delhi and in Noida. “I have asked for a report from the Director-General of Health Services and only after going through it I would be able to decide what action to take,” he said. So far five suspects have been arrested in connection with the “kidney racket”. The racket came to light last month after a man lodged a complaint with the police here alleging that his kidney had been illegally removed from an Army Hospital. During the investigation and interrogation of the accused, the police found that the racket was spread across four hospitals. Kolkata was inundated following incessant downpour, which began yesterday, throwing life out of gear today. According to an official report, five persons were killed in incidents of house collapse, but an unofficial figure put the toll at nine. Rains upset vehicular traffic and transport system in the city and its adjoining areas. Schools, colleges and other educational institutions were closed. Attendance in most of the offices was thin, which affected office work. Rains affected train services, both on local and long-distance routes, on several sections in the Eastern and South-Eastern Railway, as railway tracks remained submerged in water in several divisions. Subsidence occurred at five places on the track between Farakka and Malda, which forced the railway authorities to cancel several long-distance trains on the route, including the Teesta-Tosha Express, the Hatebazarey Express and the Saraighat Express. The Shatabdi Express running between Howrah and Malda was also stopped. Rains, accompanied by squally wind and cyclone, hit the city and the adjoining areas last night, following a depression in the coastal region at Machlipattanam in Andhra Pradesh. According to the meteorological department, the squally weather was likely to prevail for another 24 hours and it will gradually improve when the depression slowly weakens. Many houses in the city and suburbs collapsed and trees uprooted due to gusty winds. Most of the low-lying areas in the metropolis and neighbouring areas were inundated, rendering thousands of people homeless. Buses, taxis and other public transport vehicles were few and far between on the roads. The state government has opened special control rooms at Lalbazar and other affected district headquarters to deal with the situation. Arrangements have also been made to rescue the marooned. A sum of Rs 1 crore has been sanctioned from the emergency relief fund for the rescue and rehabilitation operation in the affected areas. There were murmurs in government circles that having been a bureaucrat himself, Dr Singh was more comfortable dealing with the bureaucracy than with his Cabinet colleagues. This feedback gradually percolated to the Prime Minister’s Office (PMO), which then swung into action to address this grievance. “It was, therefore, decided to widen the process of consultations in order to get more political inputs,” PMO sources disclosed. It was admitted that several ministers had obliquely conveyed that the Prime Minister was acting on the advise of his bureaucrats and was not paying sufficient heed to his Cabinet colleagues. This, they felt, deprived him of a political perspective in the framing of policies and key decision-making. “You cannot have officials and advisers articulating important policies,” said a UPA minister. Sensitive to any kind of criticism, Dr Singh’s aides decided to add another layer to the consultative mechanism already in place. Consequently, Dr. Singh will have breakfast meetings with his Cabinet colleagues in the coming weeks. To begin with, the Prime Minister had one such meeting with Railway Minister Laloo Prasad Yadav which was followed with a luncheon meeting with young MPs. Many more one-to-one meetings with ministers are now in the pipeline. Although PMO officials maintain that Dr.Singh will use these interactions to discuss matters relating to the individual ministries, the basic purpose is to mollify his Cabinet colleagues. This consultation process also has its genesis in an ongoing silent turf war between External Affairs Minister K. Natwar Singh and National Security Adviser J.N. Dixit. The latter is a key player in the composite dialogue with Pakistan and it was his secret meetings with his Pakistani counterpart Tariq Aziz which laid the groundwork for the recent Singh-Musharraf meeting in New York. However, the PMO was faced with an embarassing situation on the eve of Dr.Singh’s meeting with Pakistan President Pervez Musharraf when a senior government official was quoted in Time magazine about India’s willingness to make territorial adjustments with Pakistan to settle the Kashmir dispute. This was promptly denied by the External Affairs Ministry. Similarly, the PMO was put in a tight spot following recent news reports that PM’s Internal Security Adviser M.K. Narayanan would directly oversee the Kashmir and Manipur situations since the Home Ministry had failed on both fronts. The PMO was constrained to issue an offical clarification that the two states remained under the Home Ministry’s purview. “We do notice from the SLP papers (of the officer) that he was not a party and was not heard in the matter, therefore, the High Court was not justified in making such adverse remarks and directing inquiry against him,” a Bench of Mr Justice N Santosh Hegde, Mr Justice S B Sinha and Mr Justice A K Mathur said. The Municipality Administrator, in his special leave petition (SLP), had alleged that the High Court had made certain adverse remarks against him while hearing the case of Hotel Yatri, owned by Munshi Ram, even when he was not party to the matter. His counsel Bimal Roy Jad told the apex court that Hotel Yatri owner had “misused his connections” with some influential persons in “high positions” to frame Mr Shyam Lal for doing his duty honestly for stopping the “illegal” construction by him. In the SLP, four other officers of the municipality had made similar allegations against the hotel owner. The High Court order would not be the basis of any such investigation and it “would have to be independent of the observation found in the impugned judgment,” the apex court said. It would be open to the Municipality Administrator to challenge any investigation against him under the law on the ground available to him, the court said. A Bench of Ms Justice Ruma Pal, Mr Justice S.B. Sinha and Mr Justice S.H. Kapadia, however, deferred its decision on lifting of the ban and asked the authorities concerned to place the proposal on record by including the National Environment and Ecology Institute (NERI) as party to the decision making process. Since the meetings of the Group of Ministers (GoM) and a committee of officers to lay down preconditions for organising cultural programmes near the monument during the “Taj Mahotsav” would be held on October 13, the court allowed two weeks’ time to the authorities concerned to place the entire package of proposal before it. The UP Government had sought the lifting of the apex court ban on night viewing of the Taj on full moon, two preceding nights and two nights after it for six months during the Taj Mahotsav, being celebrated to mark its 350th anniversary. Among the conditions required to be fulfilled for meeting the security and other aspects, the ASI and the CISF in their affidavits stated that an X-ray machine needed to be installed at the entry point to screen cameras to be taken inside by tourists as was done at airports. The two agencies also demanded installation of computerised ticket machines to record information about visitors but they were strictly against taking any other electronic gadget inside. The ASI, which is custodian of the Taj Mahal and the CISF, which looks after its security, said only 50 persons would be allowed entry inside the complex at one time and on a particular night the total number of visitors would not be more than 400. The tourists would not be allowed to go inside the Taj and would be allowed to view it from the “sand stone” platform, located at a distance of about 300 metres, they said adding that no vehicle be allowed within 1 km of the monument. During the three-day visit, Mr Lavrov will call on Prime Minister Manmohan Singh. He will hold a meeting with External Affairs Minister K. Natwar Singh who is also hosting a dinner in his honour. Mr Lavrov will also meet Defence Minister Pranab Mukherjee. This will be Mr Lavrov’s third meeting with the External Affairs Minister since July 2004. It is expected that a wide range of issues of bilateral cooperation, regional and international interest will come up for discussion, the Foreign Office spokesman said. “Giving reservation on religious grounds just for votes has exposed the communal and divisive face of the Congress and its government,” BJP Vice President and spokesman Mukhtar Abbas Naqvi said on phone from Mumbai. His reaction came after the Election Commission observed that the government decision for setting up National Commission for the Welfare of Socially and Economically Backward sections among religious and linguistic minorities “at this juncture when elections are being held in two states of the country gives the impression of being aimed at influencing some sections of the electorate”. Mr Advani alleged that for the first time since Independence, the country had a “selected”, and not an elected Prime Minister. He went on to say that Ms Gandhi had assumed extra-constitutional authority under the chairmanship of the National Advisory Council. Mr Advani also hit out at the Left parties for hijacking the country’s economic agenda. “The Left disposes what the Congress proposes”, Mr Advani said. The Leader of the Opposition also accused the Central Government of being a mute spectator even as extremist groups become suddenly active in the North-East. He said while the politicians made the laws, the writers and poets could create the mindset that made those laws. Mr Reddy said free exchange of ideas among SARRC writers would affect the lives of the people of the countries of the region. The minister said people of the region were common inheritors of vast sub-continental inheritance but the vision was blurred by the memories of conflicts in the recent past. He said aesthetic norms and the broad philosophy of life in the South Asian countries were “not divergent” and the histories of the SAARC countries had followed a congruent path in the dynamics of the socio-political forces that influenced the region. The SAARC countries also shared common social and economic problems like slow economic growth, illiteracy, unemployment, pollution, unplanned urban growth and poor productivity, he said. Former Prime Minister V P Singh hailed the improvement in Indo-Pak relations. The Indian delegation, led by award-winning author U R Ananthamurthy, includes Oriya writer Pratibha Ray, Assamese novelist Indira Goswami and English poet Keki N Daruwalla.